FOLDS UP WHEN NOT IN USE - The foldable design of this tray makes it convenient to fold to a closed position while it hangs at the back of the front seat. Enjoy your favorite drink or snack on the go! This handy food snack tray lets your little munchkins to eat their food comfortably without the mess in the back seats while traveling. The sturdy design of this tray features a large flat surface with two cup holders that hold both food and drinks steadily as you drive to final destination. Say goodbye to drinks spilled and food on the floor and in between the seats, you know it is not a recipe for a clean smelling car. Simply the wrap the included around the headrest in the back of the front seat and tighten it for a snug fit. 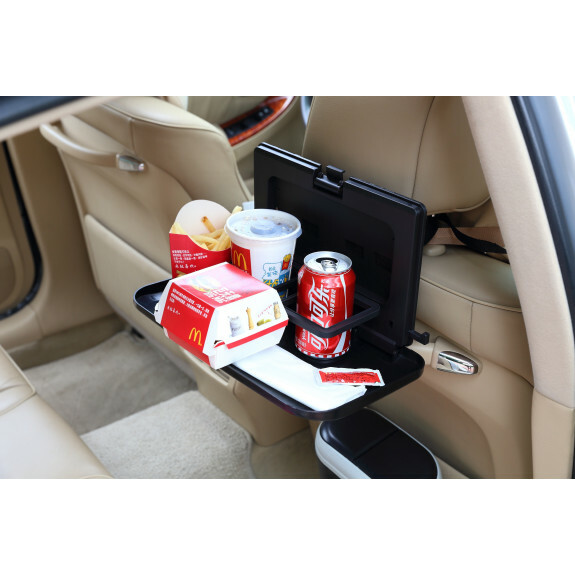 The tray is foldable so you can close it when not in use and can be stored in your back seat pocket. Passengers in the backseat will be entertained by their electronics and maybe have a book or something fun to play, and this tray is built with that in mind. Not only this tray is designed for lunch/snack, bt you arrange your mobile phone, tablet, book, wallet, and any preferred items for your convenience.